An overweight child at Hershey Park's water park in Hershey, Pennsylvania. You don't have to be an epidemiologist to know that America's children have a weight problem. In the classroom and on the playground, across socioeconomic and racial groups, kids have been getting heavier over the past three decades. But a new study published in this week's Journal of the American Medical Association (JAMA) shows some evidence that the childhood obesity "epidemic" may finally be leveling off. Researchers led by Cynthia Ogden of the Centers for Disease Control and Prevention (CDC) analyzed survey data gathered between 1999 and 2006, and found that the prevalence of overweight and obesity among American schoolchildren has plateaued at about 32%. After years of rapid increase  the percentage of 6- to 11-year-olds classified as obese rose from 6.5% in 1980 to 16.3% in 2002  that sounds like good news. "We can be cautiously optimistic that it seems to be leveling off in recent years," says Ogden. 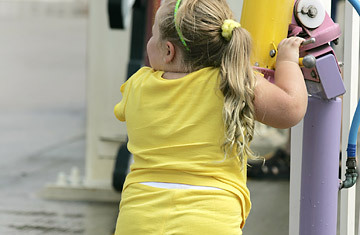 Ogden wouldn't speculate as to why national childhood overweight trends appear to have stalled. It could be that kids have hit the fat ceiling  they've gotten as heavy as they're ever going to get. Or, perhaps the most obvious answer is the nationwide effort to combat obesity by getting kids  and parents  to eat better and exercise more. From Arkansas, where state officials have begun sending annual childhood health reports to parents, to Massachusetts, where the town of Somerville launched a community-wide intervention to improve the diet and fitness of children, state and local governments have recognized and begun addressing childhood obesity. Last year the Robert Wood Johnson Foundation pledged $500 million over five years to fight the epidemic, with the aim of halting the rise in childhood obesity by 2012. It's obvious that families and officials have begun to understand that the American environment  which promotes fattening fast food and sedentary screen-sucking  needs to be changed to save the country's children. But it's still far from clear that it was community intervention that blunted the childhood obesity epidemic  or that indeed the problem isn't still getting worse. Ogden admits that more time and data are needed before we can definitively argue that America's kids have stopped getting heavier. And even though the CDC data comes from an authoritative source  the National Health and Nutrition Examination Survey (NHANES), which has been ongoing since the 1960s  calculating childhood overweight rates is an inexact science. NHANES tracks kids' body mass index (BMI), a ratio of height to weight commonly used to approximate whether a child should be classified as overweight. But BMI is far from perfect  different ethnic groups tend to carry weight differently, and the ill effects of excess body weight can arise at different BMI levels. The statistic doesn't measure, for example, how much fat a child is carrying around the middle, which seems to be the best indicator for the negative health risks due to overweight. So, kids may not have gotten heavier over the past several years, but that doesn't necessarily mean they've gotten healthier. Even if the childhood obesity epidemic has truly peaked, the levels remain frighteningly high. A country in which more than 30% of children are overweight is not a healthy one. Already pediatricians are diagnosing type 2 diabetes  what used to be known as adult-onset diabetes  in heavy children. And studies show that childhood obesity is significantly associated with heart disease in adulthood. The consequences for the country's already overburdened health care system  not to mention the lives of overweight and obese kids  could be catastrophic. Even if recent interventions have managed to stop the rise in childhood obesity, saving the most at-risk groups  especially poor minorities  could require far more time, money and energy. Obesity experts see few other options. As an editorial accompanying the JAMA paper concludes: "without substantial declines in prevalence, the public health toll of childhood obesity will continue to mount." "The childhood obesity epidemic is a tsunami," says David Ludwig, an obesity researcher at Children's Hospital Boston and the co-author of the editorial. "We're beginning to see the wave hitting the shore."